Adults Only- What could be more unique than your own private Covered Wagon, set near a Welcoming Campfire? A comfortable queen bed with luxury linens, clean towels, and front porch. For those of you who just cannot seem to stop long enough to take a breath...relax by a nightly campfire at Texas Longhorn Ranch! 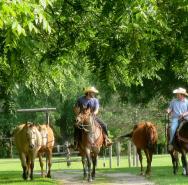 Hike, bike or book a horseback ride along the Sydenham river.....up hills and across creeks and leisurely travel through our magnificent Texas Longhorn cattle.